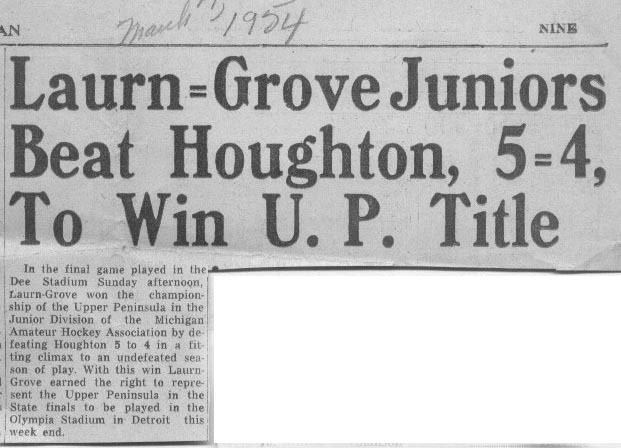 Teams from Michigan's Western Upper Peninsula. 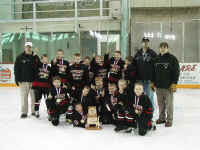 If you have a picture and article about a UP Hockey Champ team, please contact the webmaster. 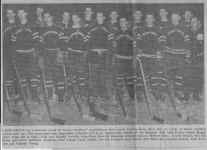 Back Row Lt to Rt: Paul Coppo, Louis Salani, Gerald Frenette, Ken Storm, Bob Hauswirth, Donald Dennis, Jack Fountain, Timothy Young. 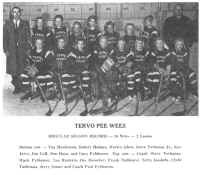 Front Row: Ronald Verville, John Ricci, Donald Holombo, Edward Santori, Michael Houle, Lowell Dennis, Roy Hiltunen, Coach Carl Jacobson. 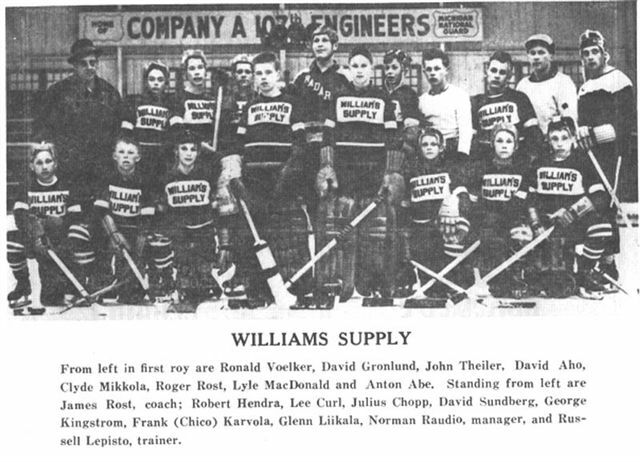 Standing L-R: James Paull, Paul Lehto, Donald Effinger, Carl Bjorn, Paul Erkkila, Donald Secor, Fred Bieti, Robert Gaabo. 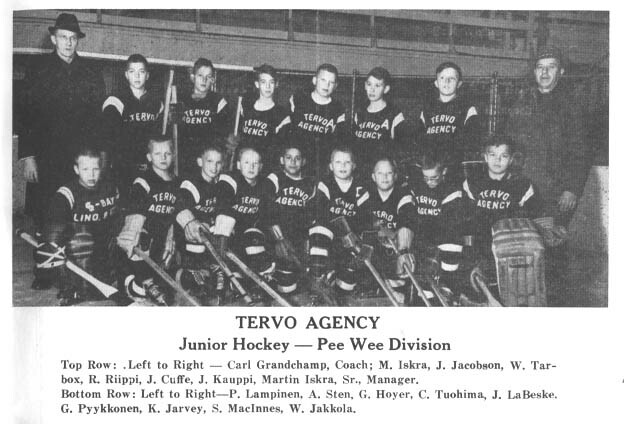 Kneeling L-R: James Frantti, Arthur Kuusisto, Roger Peterson, Coach Larry MacKey, Albert Erkkila, Gerald Kuopus, Paul Rautio. Photo courtesy of Bob Erkkila. Photo from Chassell Smelt Jamboree 1962 bk. Photo from Chassell Smelt Jamboree 1963 bk. 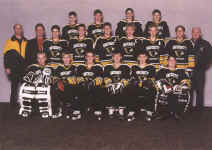 Top Row L to Rt: Coach Stan Rogers, Mgr Dan Junttila, Assist.Coach Jeff Stromer. Middle row: Max Adolphs, Trey Saari, Caitlin Rose, Dana Dillon, Dan Datto, Carlson Stevens, Mike Stevens. 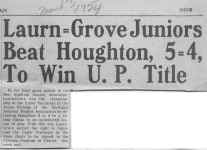 sponsored by Parkway Chevy, Calumet. 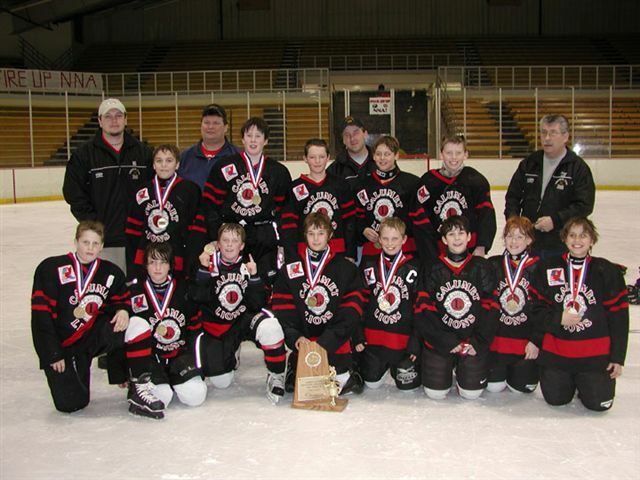 Front L-R: Aaron Nelson, Tyler Kangas, Connor Hannon, Ted Pietela, Brandon Stimac, Jesse Junttila, Levi Erkkila. Photo Courtesy of Steve Kangas. 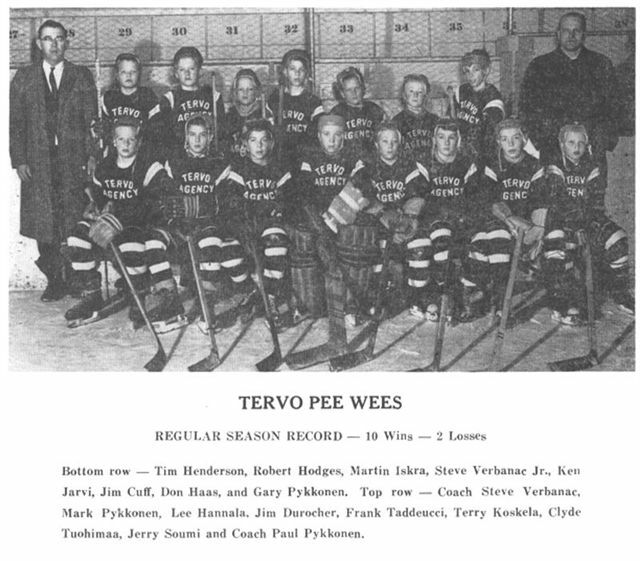 Top Row of Assistant Coaches: Greg Givens, Peachy Parks , and Phil Baranowski. 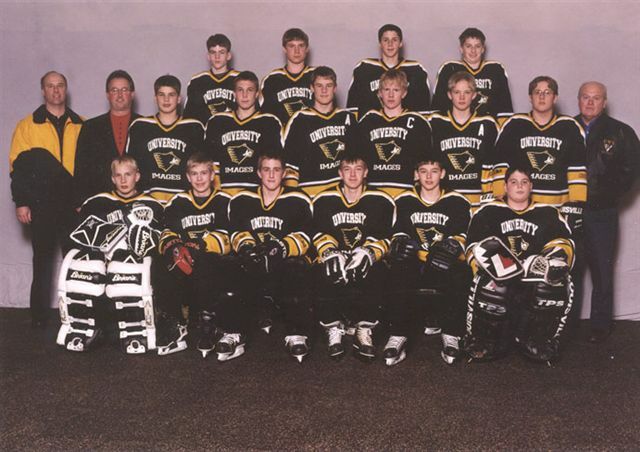 Middle Row L-R: Corey Mullins, Jacob Ahlborn, Cody Carlson, Luke Baranowski, Zak Hill, and Head Coach Buzzy Bausano. 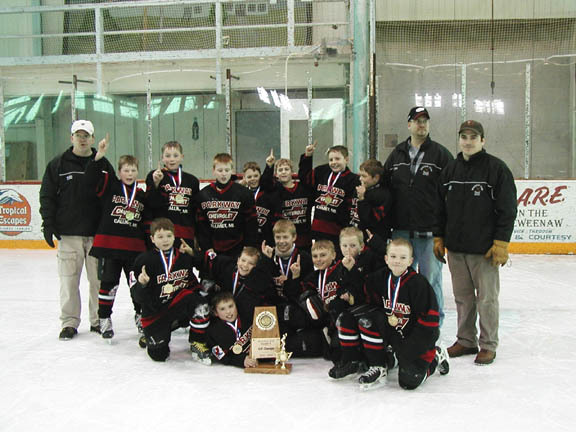 Kneeling L-R: Dano Goldsworthy, Trevor Givens, Dylan Peterson, Tony Peltier, Byron Parks, Darren Bausano, Heath Johnson, and Michael McClean. 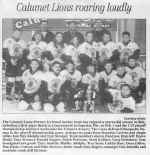 The Calumet Lions PeeWee A hockey team won the Upper Peninsula Championship (MAHA District 8) on February 5, 2005 at the Lakeview Arena in Marquette . Coming into the best-of-three series with Marquette , the underdog Lions were 0-7-1 in the 8 regular season games between the two teams. 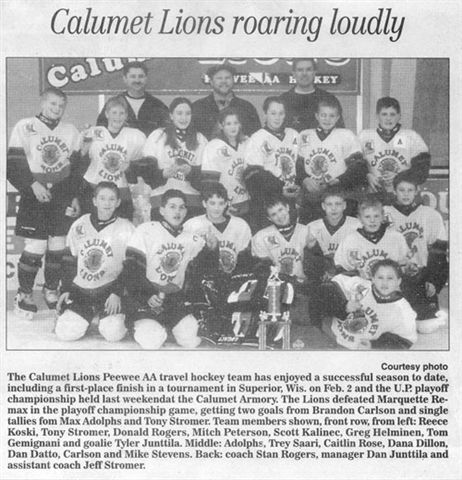 The Lions won the Friday game 3-2 and lost a hard fought Saturday morning game 4-3. The afternoon finale went to overtime at 0-0 and Byron Parks scored two minutes into the extra session to secure the Lions a trip to the State Finals. Tony Peltier earned his third shutout of the season in goal for the Lions. 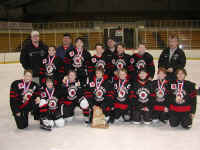 The PeeWee A State Playoffs will be held March 4-6, 2005 at the downstate St. Claire Shores Civic Arena. Photo courtesy of Mark Ahlborn.